Likud Minister downplays poll which found that Lapid could form a coalition with help from Joint List party. 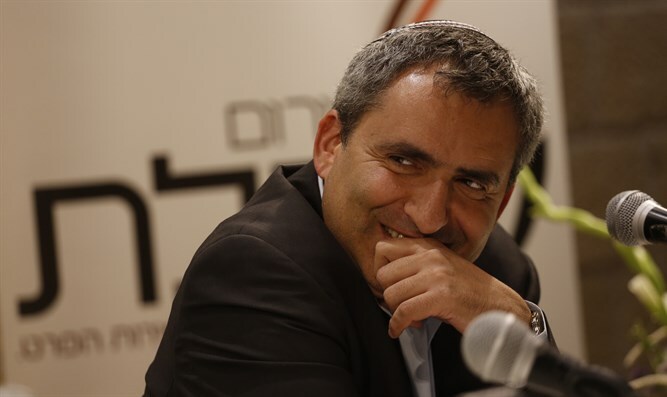 Minister Ze’ev Elkin (Likud) on Saturday night downplayed a Channel 2 News poll from Friday, which found MK Yair Lapid’s Yesh Atid party winning four more seats than the Likud and possibly forming a coalition with the Arab Joint List party. The poll found that, if elections were to be held today, Lapid would win 26 seats (compared to 11 seats in the current Knesset), Likud would win 22 (compared to 30 in the current Knesset), the Joint List would win 13 (the same as it has today), and the Zionist Union would crash to 11 (from 24 today). The Jewish Home party would win 11 seats (compared with 8 seats today), Moshe Kahlon’s Kulanu would win 7 (10 today), United Torah Judaism would achieve 7 (6 today), Yisrael Beytenu 7 (compared to 6 today), Shas would win 6 (7), Meretz would win 6 (5), while former Defense Minister Moshe Ya'alon’s new party would win four seats and would be on the edge of the electoral threshold. A count of the “seats” in the poll shows that the bloc of parties that would likely not be a part of a coalition headed by Binyamin Netanyahu would consist of the Zionist Union, Meretz, Yesh Atid, Ya'alon's party and the Joint List. “I hope that when we do get to elections, Israeli citizens will ask themselves whether they are prepared to have someone who has no experience at all lead them in the complex situation in Israel, and whether they want it to be based on the votes of the Arab Joint List, and will answer very clearly at the ballot box, as they did in the last elections, and will vote for Netanyahu and the Likud. There is no other sane alternative,” added Elkin.